Check back here periodically for updates on projects here at Triton Space Technologies, LLC. 3 New Products and Shop Tour! We are very excited to announce the unveiling of three new products that we have recently developed! These products continue to expand our line of pyro actuated valves centered on our Low Cost Initiator. The first product is our new TS-80YC, a cryogenically rated pyro valve, which has been specifically engineered for use with liquid oxygen and liquid methane. 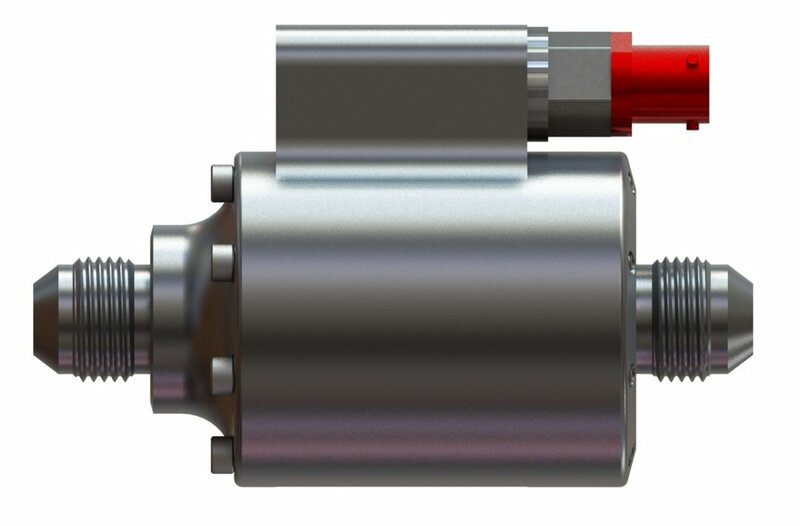 This valve is small and compact with AN-8 male 37 degree flare connections and a similar in-line flow path to our previous valves. Weighing in at just 0.9 lbs it is a perfect solution for small sounding rockets designed to use LOX/CH4. In fact we have designed this valve specifically for customers from University Rocket Teams looking to compete in the $100,000 FAR-MARS challenge. With a starting price of only $3,499 and discounts available for University Rocket Teams this is our most affordable high flow pyro valve yet! The second product, which is used in the TS-80YC above, is a new modular pyro cartridge assembly that serves as a valve by itself. When the pyro fires, a plunger ruptures a small metal burst disk allowing gas flow between inlet and outlet of the cartridge assembly. This one time use cartridge allows for very rapid re-use of the TS-80YC. No more need to swab out the pyro cavity and clean out soot from the previous actuation. Simply swap out the Pyro cartridge and the valve is ready to go again. There isn’t even any need to remove the valve from the plumbing it’s installed in! With this design improvement you gain the simplicity and reliability of a pyro valve with the reusability of a non-pyro valve. We will be rolling this design upgrade into all our previous pyro valve designs over the next few months. These Pyro Cartridges will be selling for only $59.99 and provide an easy-to-use, clean and simple improvement to our pyro valve product line. 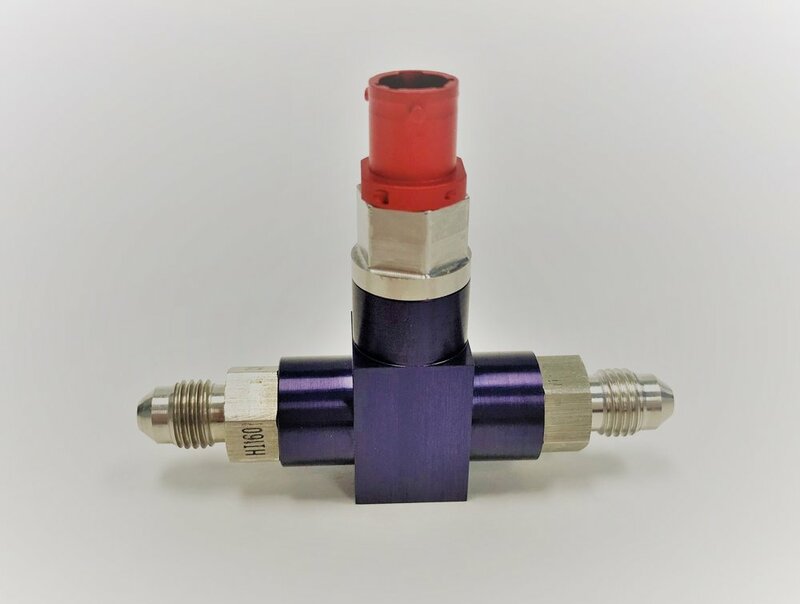 The third and final new product, the TS-20Y, is a valve body that allows the user to employ the Pyro Cartridge as a stand alone valve for ¼” AN-4 plumbing. With an ESEOD of 0.124 and a CV of 0.28 this valve is ideal for situations requiring a valve of similar capability to a ¼” solenoid valve, but it delivers this functionality in a much more compact and lighter weight package. Weighing in at only 3.7 ounces or 105 grams and selling for only $249, the TS-20Y is ideal for sounding rocket propellant tank emergency vent valves and pneumatic system enable valves. With an operating pressure of 0-3,000 psi the TS-20Y is well-equipped to service any high pressure gas system requiring a single use On/Enable functionality. All three of these new product designs and prototype testing are complete and we are finalizing production of initial stock for sale on our website. The Triton Space Technologies, Team.